The history of Miss Maria Wilkins : adorned with cuts. First sentence: "Miss Maria Wilkins was the only child of Mr. and Mrs Wilkins who thought themselves superior to their neighbors, by whom they were reckoned to proudest people in the town they lived in." 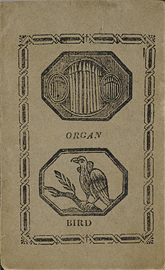 Copy in McGill Library Rare Books and Special Collections: brown wrappers. text.chapbook.black and white, 11 x 6 cm. The McGill Library's Chapbook Collection was made possible through a generous donation from the Harold Crabtree Foundation. All images licensed under Creative Commons Attribution-NonCommercial 3.0 - http://creativecommons.org/licenses/by-nc/3.0/deed.en_US. For information, please contact Rare Books and Special Collections, McGill University Library.